New Blackwork Piece - "Kick Up Your Heels"
This my new blackwork design, Kick up Your Heels! I am pretty excited about this - it was a lot of fun to design and stitch and I loved playing with the colours. Here is a closer shot if you would like to see more details - check out the purple crystals - gotta love that bling! I designed this for my Seminar Theme Award entry. The theme of this year's seminar was Stampeding Stitches so I dreamed up this pair of cowgirl's party boots. Managed to snag third prize so not to shabby. Now, what to do with the design? It is so strange to me that I am unable to read fiction anymore at home! According to my "sleep doctor", I lack the necessary ability to concentrate because of my sleep apnia and the resulting chronic fatique it causes. I can read non-fiction and devour books on needle and fibre arts but not fiction. Strange, yes? Out here at the campground though I am able to devour books of any kind for some reason and usually read a every day or two. So, the book reviews begin! 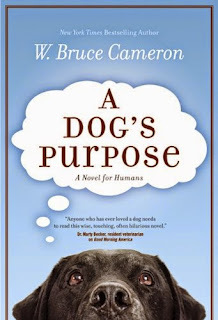 Yesterday on my day off I visited the thrift store and picked up A Dog's Purpose by W. Bruce Cameron. What a lovely read it was - a cross between Tuesdays with Morrie and Marley and Me! I recommend this one to anyone who is an animal lover - you will love the gentle humour of a dog's perception of the world and events around him. I really recommend this one 4* our of 5. Sometimes I don't blog because I am not getting any stitching done - this time it is because I have been too busy stitching! Lots to share and will be doing that in the days to come. A personal note first though - after a summer at home last year, I am back to living and working in a campground again this summer. Different campground this time so no "notes from the lake" this year. This campground is very much different from the previous one. Besides there being no lake, there is a river AND TREES!! I am very happy not to be sitting on the bald prairie all summer and very much enjoying waking up to so much birdsong every day. The photo above is my home for the summer - did I mention I love the trees?? ?